The issue of junk food being available in schools, whether through chocolate and crisps on sale in vending machines or fast food on school dinner menus, has become a political hot potato in the last few years, and a bone of contention for celebrity chefs who see it as their duty to try and change the eating habits of the nation. When Jamie Oliver went into a school in London, on a mission to see what the local education authorities were feeding their kids, he was horrified to find junk food - in the form of cheap mass produced potato shapes and the now infamous ‘Turkey Twizzlers’ as menu staples. His television series ‘Jamie’s School Dinners’ approached the subject from an economical point of view, trying to convince the dinner ladies at the school that yes, they could feed their charges on the amount of money that the government allocated, without feeding them full of E numbers and reconstituted potato. The programme aired in 2005, and it caused a fair amount of controversy. 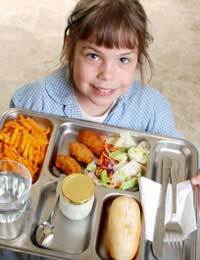 Before Jamie had highlighted the sort of junk food and fast food that children were being served at school, the public had seemed blissfully ignorant about it, but once the subject could no longer be swept under the carpet, parents and pressure groups began to lobby the government to take some sort of action. School Dinners – Room For Improvement? In 2006, it was announced by the then Education Secretary, Alan Johnson, that meals high in salt and fat would be banned from all English school dinner menus. Also banned from schools across the country were other types of junk food like low grade sausages, burgers and meat products, sweets and chocolates, crisps and other high fat savoury snacks. The Welsh Assembly and Scottish Executive also announced plans to tackle the problem. The government also promised £280 million to be spent on improving nutritional standards of the foods available in schools, and on teaching children how to cook for themselves, ensuring that kids weren’t completely lost when it came to fending for themselves after they left school. The feeling was that, as pointed out by Jamie Oliver, school dinners were in some cases the only hot meal some kids were getting, and if this meal wasn’t healthy, they were getting a consistently poor diet. Vending machines were also overhauled to stop children spending their dinner money on poor quality snack foods. Sweets and chocolates were replaced with healthier options. The most recent developments in the fast food/junk food war are proposals from the government to ban fast food outlets from opening up close to schools. Current Schools Secretary, Ed Balls, suggested in November 2008 that not only should fast food retailers be prevented from opening new outlets within 400 metres of a school, but also that children should be effectively ‘locked down’ for the lunch break so that they can’t leave the school premises and find alternative ways to spend their dinner money on chips. He said that there was no point in schools and education authorities making huge efforts to improve the standards of food available to children inside the schools if they were just going to go elsewhere to buy it. Waltham Forest Council in London has already announced plans to implement this policy, and as ever, Jamie Oliver has been lending his support to the plans. How this idea is likely to be received by some parents, such as the parents of children at a Rotherham school who actually bypassed healthy eating regulations by passing burgers and chips through the railings, remains to be seen. At the end of the day, keeping kids healthy is a joint effort, and if the parents aren’t willing to cooperate, there’s not much any school, or legislation, can do!